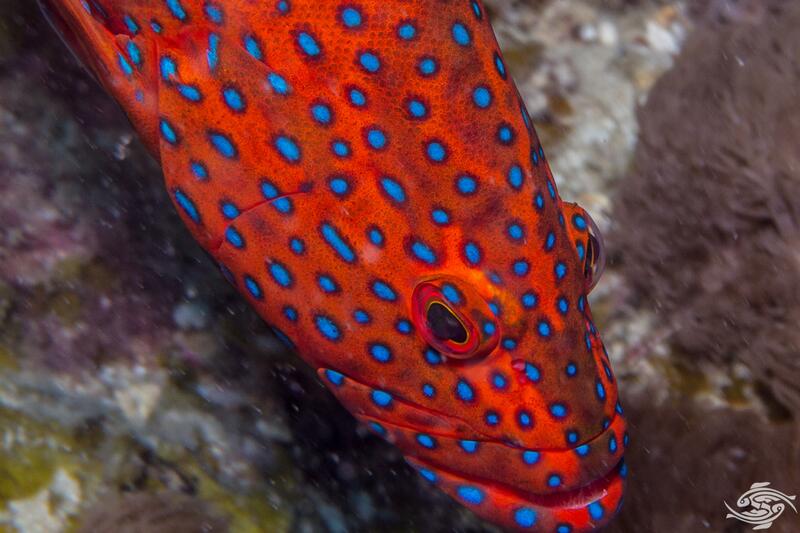 The coral rock cod, Cephalopholis miniata, is also known as the coral hind, miniatus grouper, miniata grouper, vermilion seabass, and coral grouper. 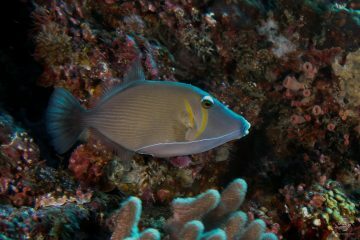 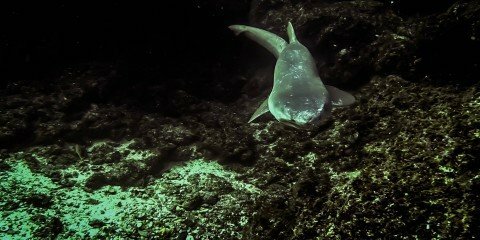 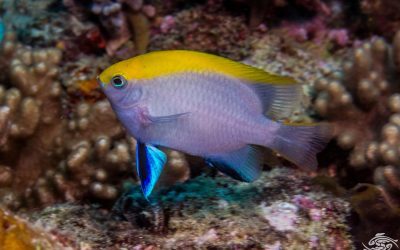 They are fairly common fish on the Tanzanian coast and are regularly seen on recreational dives. 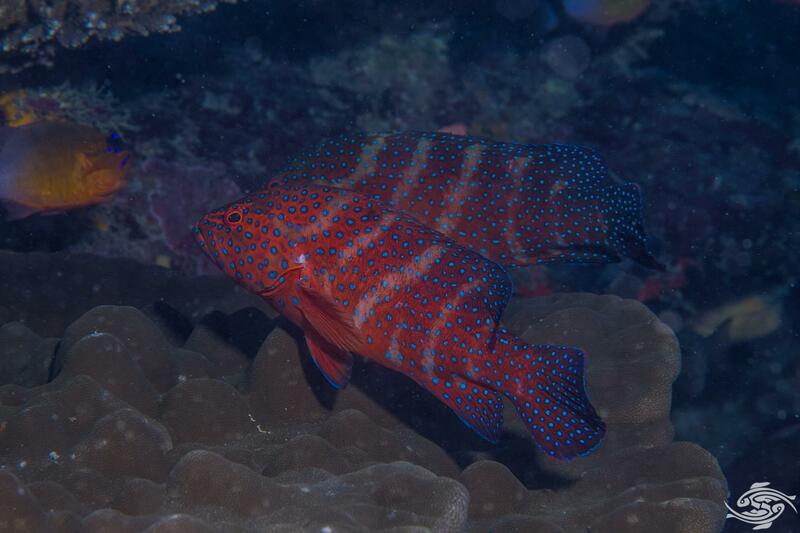 The coral rock cod has a typical grouper shape and like many other groupers can lighten or darken its coloration depending on its mood. 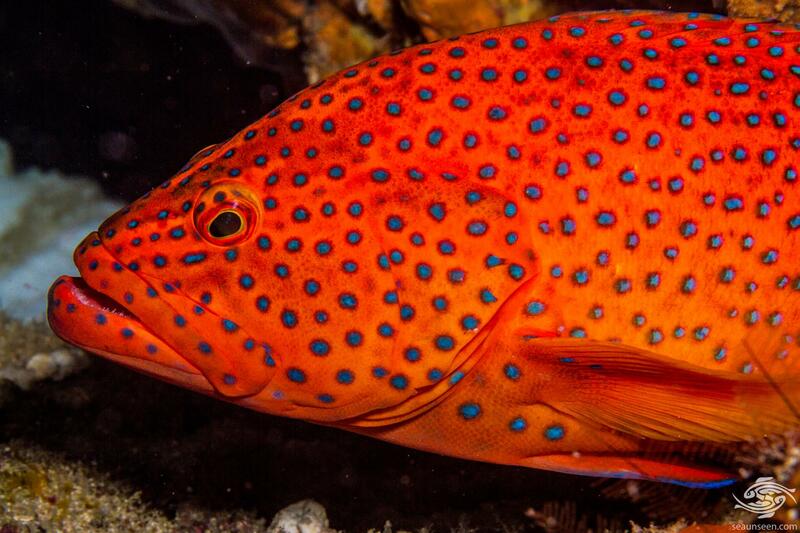 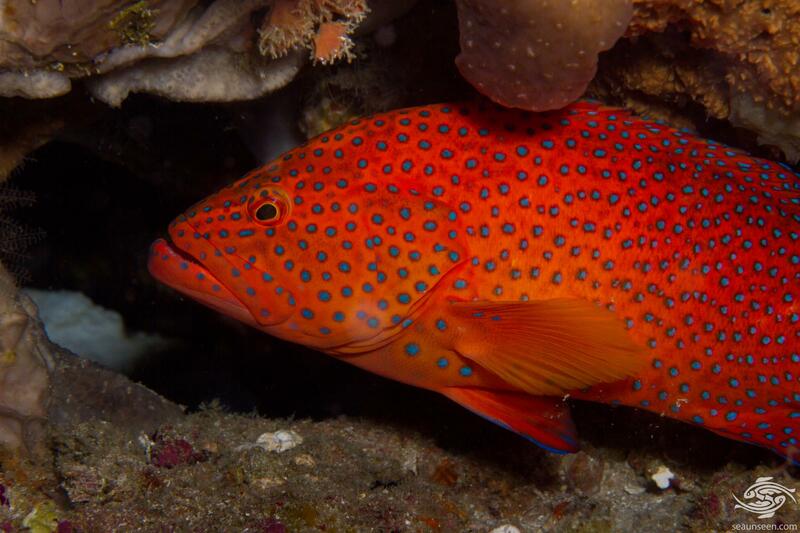 It’s typical coloration is a red orange with bright blue spots on it. 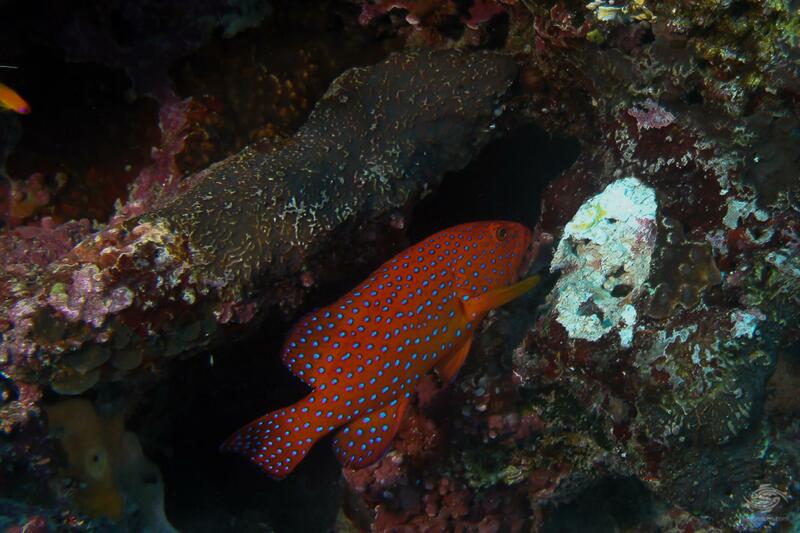 In the depths as red light is filtered out by the water so the red colour becomes darker giving it excellent camouflage. 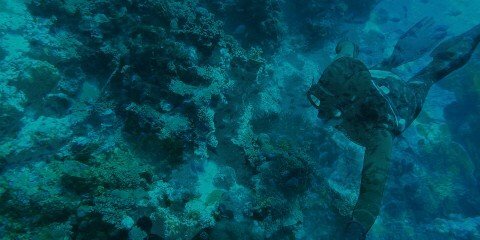 As with all grouper they have a proportionally large mouth designed for swallowing their prey whole. 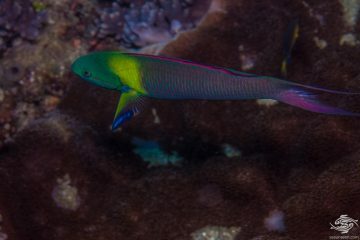 As can be seem in the images below they can also put light vertical bars on the body which aids with camouflage. 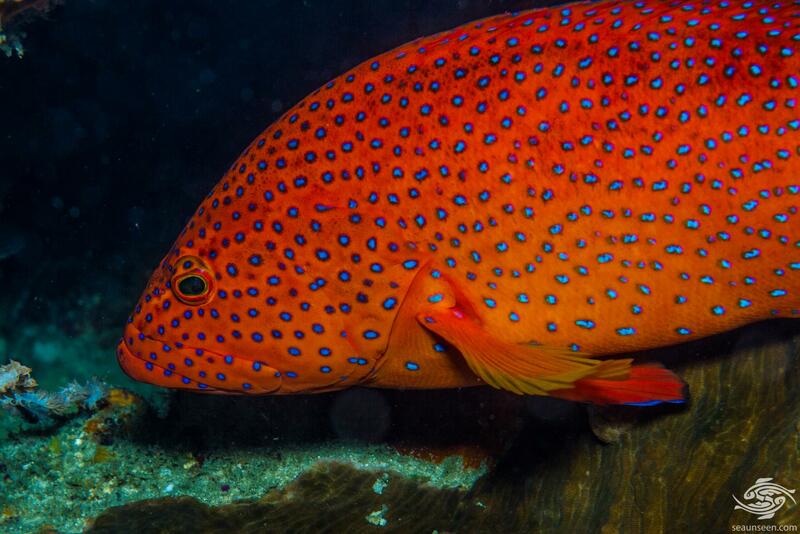 When stressed it darkens its colour to a bright red and to see one of these fish being hauled out the sea by a fisherman is quite a sight as they go a very bright red. 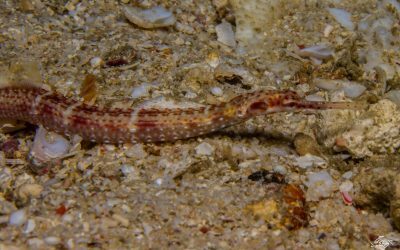 Their maximum size is between 45 to 50 cm in length although 35 to 40 cm is more common. 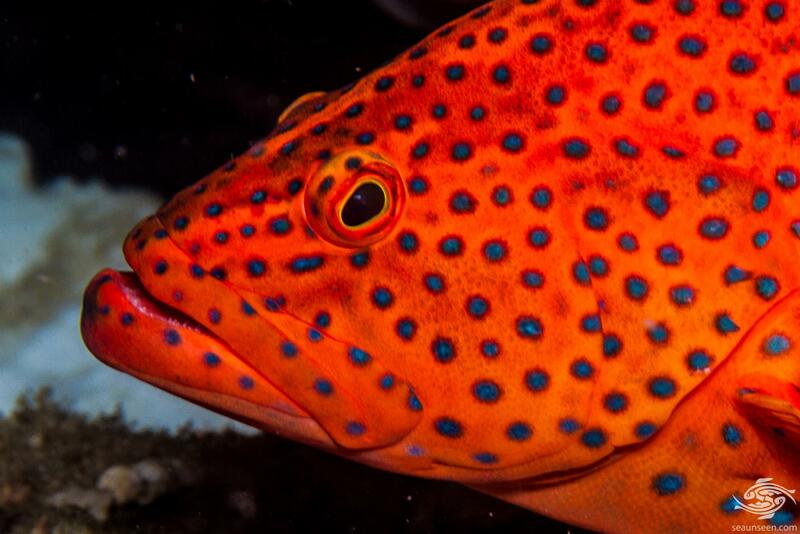 Coral rock cod are fairly shy fish when it comes to divers and will quickly either swim away from a diver and hide or they will peer out at a diver while hovering close to a hole that it can dart into. 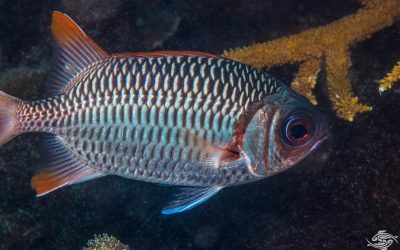 They have the ability to lighten their coloration and will sometimes have white vertical bars down their body which provides good camouflage. 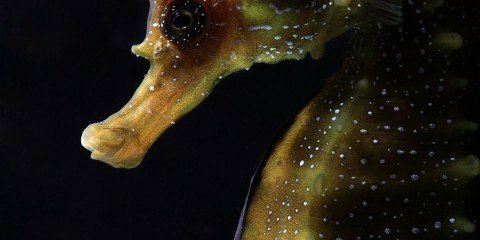 This can be seen in the image below. 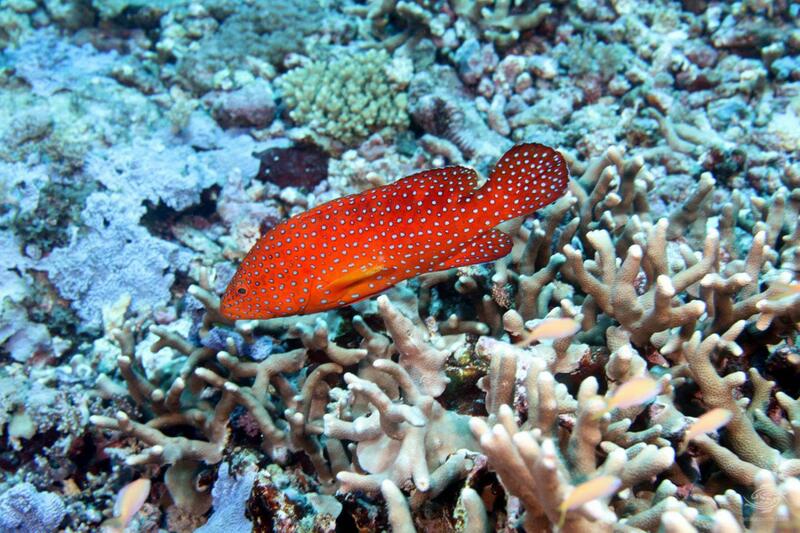 Coral rock cod are found on the East coast of Africa from Durban in the south to the red sea, eastwards to the mid pacific including most islands but are absent from the Persian and Omani gulfs. 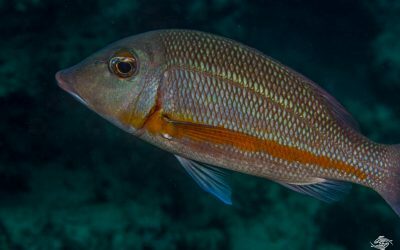 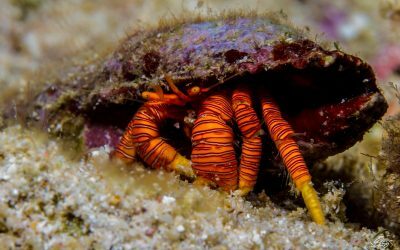 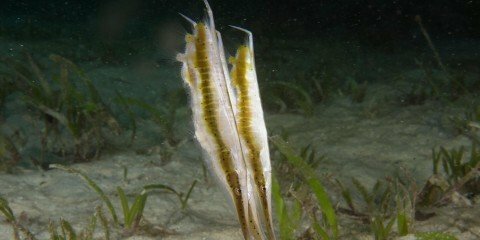 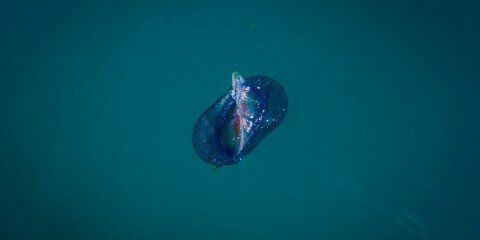 They are typically found on exposed reefs rather than in protected areas or estuaries and we have never seen one in less than 18 meters but reportedly they are found in shallower waters from 2 to 150 meters. 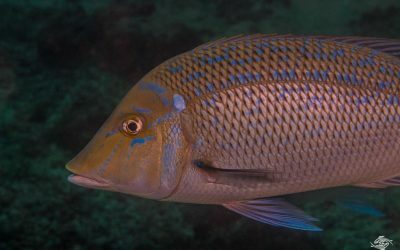 Their main diet is small fishes and crustaceans, however given they are regularly caught by fishermen on the hook this indicates that they will scavenge as well. 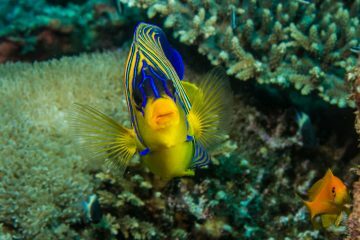 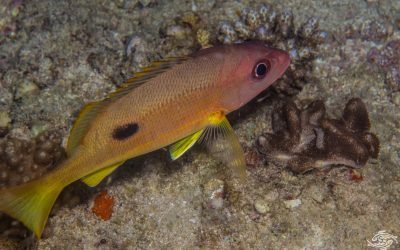 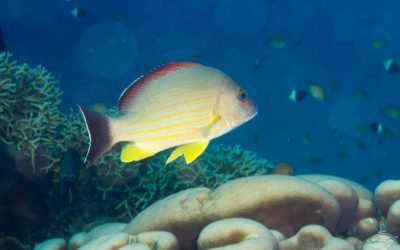 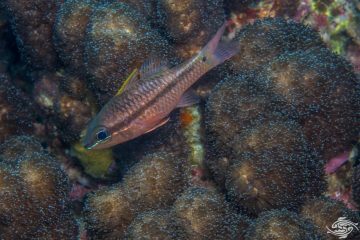 Their main prey is the sea goldy Pseudanthias squamipinnis which is in abundance on most reefs. 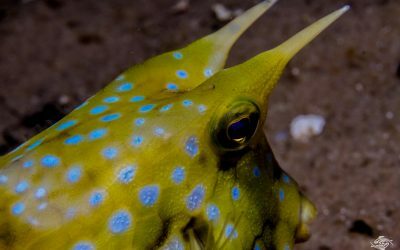 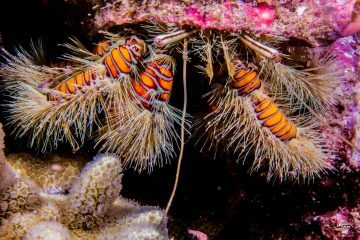 They are ambush predators and feed in the early morning and late afternoon when their coloration gives them more camouflage. 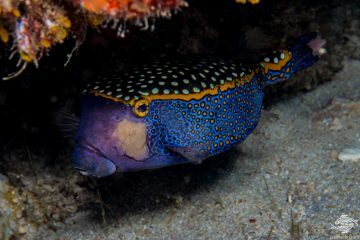 The coral rock cods form haremic groups with upt to twelve females in a group, each female having a territory which falls in the territory of the male. 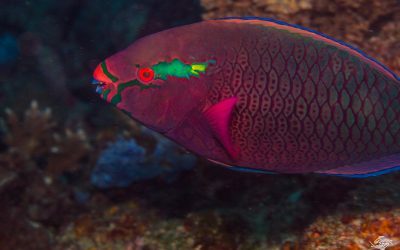 Because of their bright coloration these fish are kept in large aquariums by some collectors but because of their propensity to eat smaller fish great care has to be taken with their tank mates. 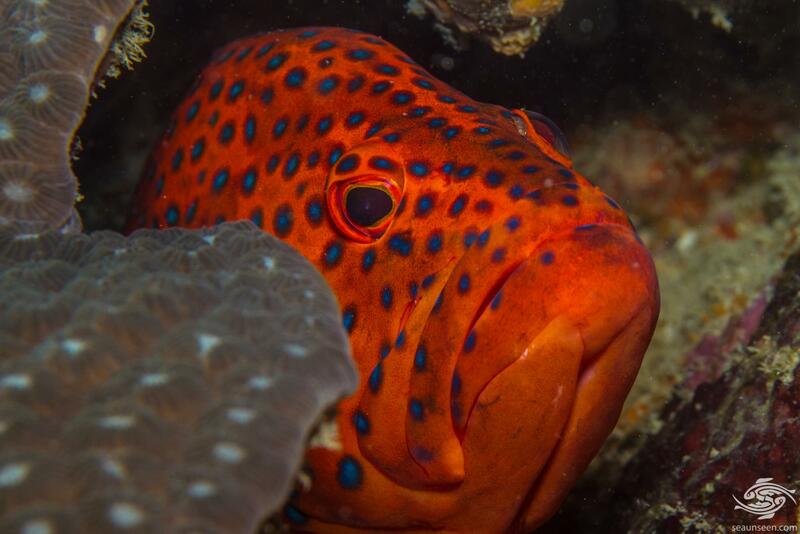 The coral rock cod is fished commercially and in most areas of the Tanzanian coast is heavily over fished.